Great supplier and customer relationships can become enduring partnerships when collaboration allows for innovation. While strong relationships can last decades on end, the businesses involved must continue to innovate to stay at the cutting edge of service. 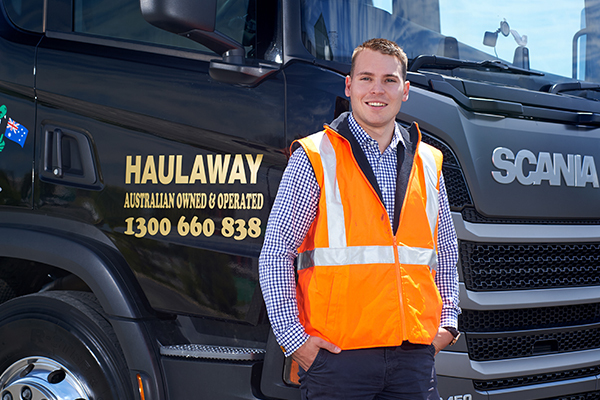 Such was the case for Haulaway, a more-than-30-year-old Melbourne-based business that has continued to take pride in providing quality trucks and experienced drivers across its transport services in the commercial waste management sector. Jake Hilbert, Sales Manager at Haulaway, says the company has, over the past 12 to 24 months, diversified its business. “We’ve evolved to stay at the cutting edge. We’ve developed from a rigids business with skip bins and front lift bins and a small fleet of rear lift to now transporting a large amount of rear lift and picking up council contracts, through to operating semi-trailers and now B-Doubles as well and looking to cart A-Doubles into the future,” Jake explains. The diversification came off the back of Haulaway picking up a range of contracts in late 2018 on major Victorian infrastructure projects, including with the Cross Yarra Partnership and Rail Infrastructure Alliance on the Metro Tunnel and West Gate Tunnel projects. The evolution began with Haulaway picking up the Metro Tunnel Early Works in 2017 while tendering for the subsequent projects. Jake says having the latest technology helped advance the business to the next level. “We’re getting to a point where every single bin will be weighed and reported, and we’re now striving to achieve whether a customer will be able to access that data within a 24-hour period of collection and hopefully down the line, even live,” he says. To support the evolving organisation, Haulaway turned to a reliable supplier in Scania, purchasing two new 8×4 450 rigids in Scania’s latest series with a Hiab Multilift hooklift on the back. The first trucks arrived in November with another two at the beginning of 2019. Scania represenatives visited the site in late 2018 and arranged for the vehicles to be fitted with the supporting hooklift. The fleets support Haulaway’s general waste removal and collection, which is taken to a recycling facility to achieve a 90 per cent recycling rate. Jake says Scania offers a portal which can be accessed from the Haulaway head office, allowing it to monitor fuel burn (average amount of fuel per load) while the vehicle is idle compared to driving. “We can see whether the driver is down the road or just sitting onsite with the truck running, which could indicate access issues, and also see if he’s operating the PTO attachment, which helps with our fuel credits as well,” Jake says. Jake says that maneuverability was crucial in the purchasing decision. “The previous series was very comfortable and we always had a lot of drivers wanting to jump into the Scania fleet. However, the latest series is comfortable, yet more manoeuverable,” Jake says. Other safety features include adaptive cruise control, lane departure warnings and a scoring system which allows Haulaway to score its drivers based on their performance caring for the vehicles. With the trucks on the road 20 hours a day hauling about 30 to 40 tonnes of waste across freeways and in and out of construction sites, a highly competitive repair and maintenance service was required. When factored into the company’s purchasing model, the life of the truck over the course of five years, including maintenance and fuel burn, turned out cheaper than competitor vehicles. “We won’t repair the cab chassis in-house. We will still carry out preventative and fortnightly maintenance mainly for safety to ensure the truck is roadworthy. All routine maintenance will be carried out through Scania,” Jake says. He says another key benefit is a dedicated account manager to support Haulaway should any issues occur – with the service akin to a pre-sales offering. “The account manager is with you even after you purchase the vehicle. We’ve found in the past we’ve bought a truck and the moment the account manager gets the signature you are put onto after-sales service,” Jake says. In after-sales support, Scania offers driver training and its Scania finance service to suit a businesses budget. Ultimately, Haulaway’s passion for offering the best customer service and value for dollar means a quality supplier can make or break its success. Jake says that he is so pleased with the service he will look at further Scanias in the future and is also looking to potentially purchase two 620 horsepower R-cab prime movers to cart B-Doubles in late 2019.